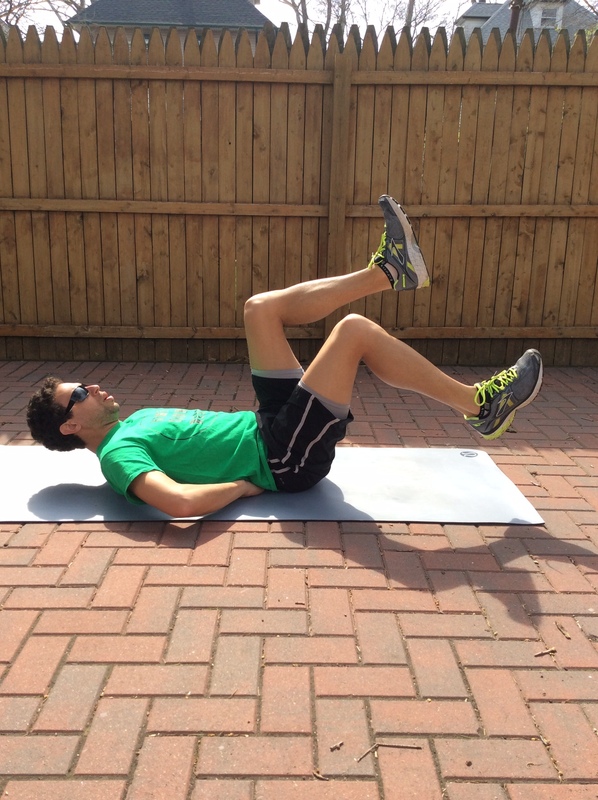 Having a strong core could literally make the difference between being injured and being a healthy runner. For me, keeping up with my core strength has been the single most important thing I’ve done for my running. You’re not going to get 6-pack abs, but you will be able to run your pace for longer without getting tired and breaking form. I think that’s a very good trade-off, don’t you? 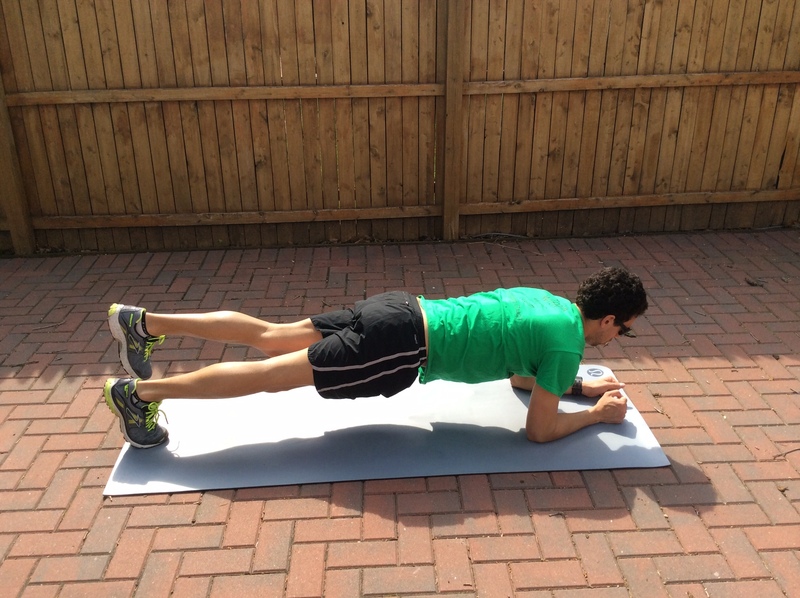 Below, you’ll find 5 different exercises aimed at targeting different aspects of your core – the powerhouse of your body! (A) Lie on your back with one hand under your lower back. Lift your legs so your thighs are at a 90-degree angle with the floor, and bend both knees to a 90-degree angle. (B) Tighten your lower back so that it doesn’t move up or down, and slowly lower your right foot to within 1 inch of the floor. Keep your right knee bent at a 90-degree angle, and maintain the position of your left leg. Hold your right foot 1 inch off the floor for 2 seconds, then return it to the start position next to the left leg. Repeat the same action, but this time lower the left foot. *Coach Marc usually does reps of 6 or 7 per leg, lasting 6 seconds before switching. Remember, head up, elbows up, and keep knees at 90 degrees, only rotating from the hip. Feet are dorsiflexed. (A) Start on your stomach, and raise yourself into a modified pushup position, with all your weight balanced on your forearms and toes. Keep your back as straight as possible. (B) Slowly raise your left leg until it lines up with your back. Hold this position for 4 seconds, then lower the left leg, and repeat for 4 seconds with the right leg. *Coach Marc does reps of 6 or 7 per leg, lasting 6 seconds before switching. (A) Lie on your back with your arms beyond your head, and your feet planted on the floor directly below the knees. Press down on your feet, and lift your torso and upper legs until they form a straight line. (B) With your weight on your shoulders and your feet, slowly extend the right leg by straightening the knee. Be sure to keep your back straight. Hold for 6 seconds, then repeat with the left leg. Repeat both sequences three to five times. position. Always lift your hips when you switch legs! Lie on your right side with your right elbow under your shoulder, and your left foot resting on your right foot. Press down with your forearm and foot until you lift your body off the ground. Keep your body as straight as possible; don’t allow your hips to sag. Hold this position in a controlled fashion for 30 seconds. Repeat on your left side. *When you get strong enough, you can lift your leg (see picture below). Remember though, form counts. Even when you are in the up position, you should be in a straight line. (A) Start on your hands and knees. (B) Maintaining the 90-degree angle of your left knee, lift your left leg until the thigh is parallel to your upper body. Hold for 4 seconds, then lower. (C) Repeat the same motion, but this time continue it by forcing the knee and thigh as far to the left as possible. Hold for 6 seconds. Repeat sequence five to six times. and flat (or parallel with the ceiling). To learn how to train like Marc & Carly, contact Coach Marc or visit him on Facebook or his website.